An Italian meat specialty made from very lean, boneless pork loin. 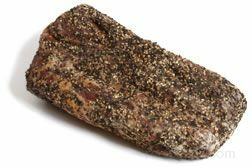 To prepare the meat, the loin is salt cured, then repeatedly brushed with salt and sugar after which it is seasoned with garlic, paprika, pepper, and other spices. The meat is allowed to air dry and when matured is ready to eat. To serve, lomo is traditionally sliced thin, similar to prosciutto, and served with breads, drizzled with olive oil, or wrapped around other foods such as fruit or cheese.